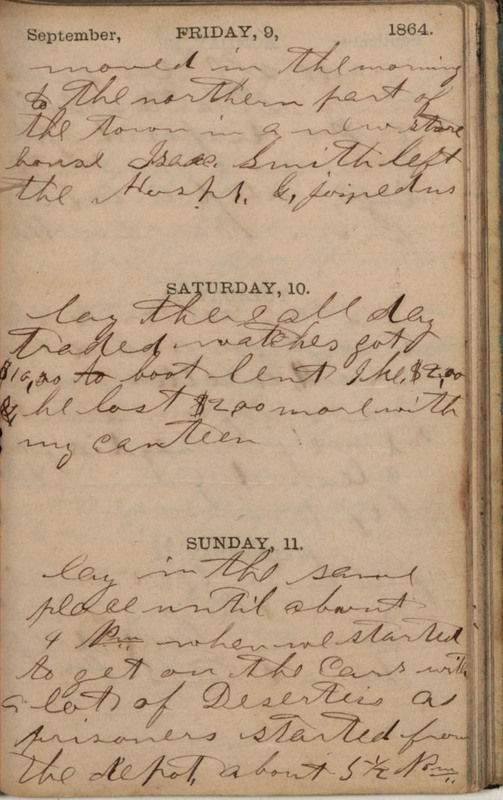 September, FRIDAY, 9, 1864. moved in the morning to the northern part of the town in a new store house Isaac. Smith left the Hospt. & joined us SATURDAY, 10. lay there all day traded watches got $10,00 to boot lent Ike $2,00 & he lost $2,00 more with my canteen SUNDAY, 11. lay in the same place until about 4 Pm when we started to get on the Cars with a lot of Deserters as prisoners started from the depot, about 5 1/2 Pm..